Love your work? With TapSnap, you have the potential to earn more money in one day than most people do in a week, while participating in exciting events and parties. Imagine earning over US$1,400 per event while helping clients create fabulous photo memories – everything from parties, weddings, trade shows, corporate functions and charity events. Work will never be the same again. That's what people say when they interact with TapSnap for the very first time. 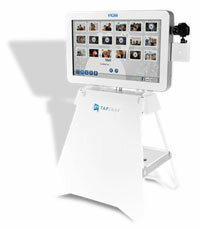 A revolutionary new photo booth without the booth, TapSnap lets everyone join in on the fun. Event guests will have a blast taking photos and drawing and writing personal messages on them, and then sharing their pictures on their social networks. Tap, Snap, Share! "Not everyone wants to dance, sit at their table, or drink at the bar. We thought about what we could do to get the non‐dancers out of their chairs and really get everyone involved. TapSnap was the solution. Just about everyone made their way over to the TapSnap area and the photos are absolutely amazing. It captured candid moments of our guests just having fun. And that is exactly what we hoped for." With as little as US$30K, you can be up and running in your own TapSnap franchise within 45 days. TapSnap events typically take place on evenings or weekends so you can become your own boss while keeping the stability of your regular employment. Or you can just enjoy the tremendous potential of part-time work, with full-time pay. TapSnap's state-of-the-art phototainment system capitalizes on the incredible popularity of social media. Over 300 million photos are uploaded to Facebook on an average day! The rapid growth of social media has been a windfall for wedding photography and other social events. Event planning and wedding sectors are experiencing tremendous growth. This is the perfect time for TapSnap! TapSnap is committed to making your business both personally and financially rewarding. This is an exclusive opportunity for the right person, one who can deliver the absolute best in customer service, and who has the drive to make TapSnap a success. Think like an entrepreneur. Act quickly to secure your place with TapSnap as only a limited number of franchise territories are available. Please fill out the form to learn more about the enormous potential of a TapSnap franchise. Click on Request Information button above for FREE information on how to start a Tapsnap franchise today! Please Note: Tapsnap opportunities for sale, and other franchise opportunities, business opportunities, businesses and franchises for sale on this web site are not to be considered as an "offering", "franchise offering", suggestion or recommendation by GlobalBX. The franchises, businesses and business brokers seen on this web site submit their own individual content. This advertisement depends entirely on the truthfulness of the information provided by our advertisers which includes, but is not limited to, franchisers, franchises, franchise brokers, franchise consultants, business sellers and business brokers. As always, GlobalBX recommends that you consult a lawyer, financial consultant, accountant or professional advisor before buying a franchise or business opportunity or any type of business. By submitting this form and requesting more information, you have agreed to all terms and policies of GlobalBX and the business and franchise offerings listed here. Please review our Terms & Conditions for more information.